70046- __--BOX OF 80 NYMO (G) BOBBINS. A BOLD EFFECT IN ANY SEAM THAT IS GUARANTEED TO GET NOTICED. THE NUMBERS (R___) MATCH "RECACRIL" 60" WIDE CLOTH. 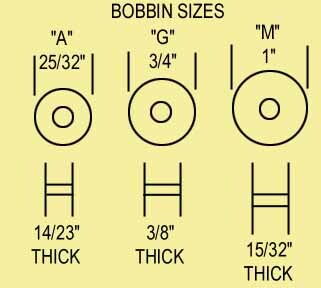 THE (M) BOBBINS FIT THE PFAFF #545 & UP, AND MOST ALL NEW MACHINES.